Veeam Backup Enterprise Manager aggregates data from multiple Veeam backup servers, as well as from the underlying VMware vCenter servers. Veeam Backup Enterprise Manager retrieves data from the managed Veeam backup servers using a data collection job. This job gets information about the backup and replication jobs, processed machines, and other data from the Configuration databases used by Veeam backup servers. Collected data is stored to the Veeam Backup Enterprise Manager database (hosted on SQL Server) and can be accessed by multiple users via the web interface. This web interface also allows for modifying Veeam job settings, license management, installing Veeam plug-in on vCenter server, and other tasks. 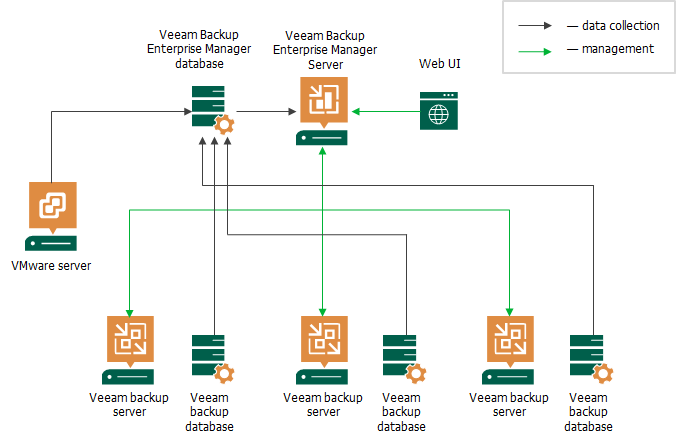 When a user modifies a backup job using Veeam Backup Enterprise Manager, these changes are communicated to the corresponding Veeam backup server and stored in its Configuration database. If you have Veeam Agent for Microsoft Windows or Veeam Agent for Linux integrated with Veeam Backup & Replication, then you can use Veeam Backup Enterprise Manager to browse and restore guest OS files and application items from a backup stored in a Veeam backup repository. These processes involve appropriate backup job setup, as well as mount and data transfer operations. For more information, see Restoring Guest OS Files.